SEATTLE — He was a 29-year-old ground-crew member, fully credentialed to be inside secure areas and certified to tow aircraft around the tarmac. But federal investigators, Sea-Tac officials and his employer are scrambling to figure out how Richard Russell managed to steal an empty 76-passenger Horizon Air turboprop plane, take off from one of the busiest airports in the country and fly it around the south Puget Sound area before a fiery twilight crash Friday evening. "Security is something that is taken very very seriously, and this clearly was a serious breach," said Michael Huerta, who until January of this year served as administrator of the Federal Aviation Administration (FAA). "It won't surprise me if steps are taken to change protocol or put additional steps in place … The insider threat is something that is taken seriously." The FBI is leading the investigation into the takeoff and crash, working with the National Transportation Safety Board, the FAA, the airlines, the Port of Seattle, which operates the airport, and state and local authorities. Investigators had not released Russell's name as of Saturday afternoon, but several sources, including a law-enforcement official, identified him to The Seattle Times. Russell's roughly 75-minute flight drew spectators on the ground, lit up social media, and caused F-15s to be scrambled from an air base in Portland as some 75 flights were delayed for up to two hours at Sea-Tac. Law-enforcement officials have said they don't believe terrorism was involved, and nothing from Russell's dialogue with air traffic control during the flight would suggest otherwise. That dialogue, captured in publicly released audio recordings, also offers little concrete in the way of motive as Russell tells an air traffic controller he just circled Mount Rainier, calling it "beautiful," and hoped to have enough gas to go the Olympic Mountains. While the air traffic controller tries to persuade him to land at Joint Base Lewis-McChord or in the water, Russell talks of wanting to do a barrel roll, "and if that goes good I'm just going to nose down and call it a night." The insider threat is a difficult one to counter. Many of the protective measures involve using background checks, such as criminal screens conducted on airline ground crews such as baggage handlers and tow operators, to ensure that anyone inside a secure area does not pose a security risk. 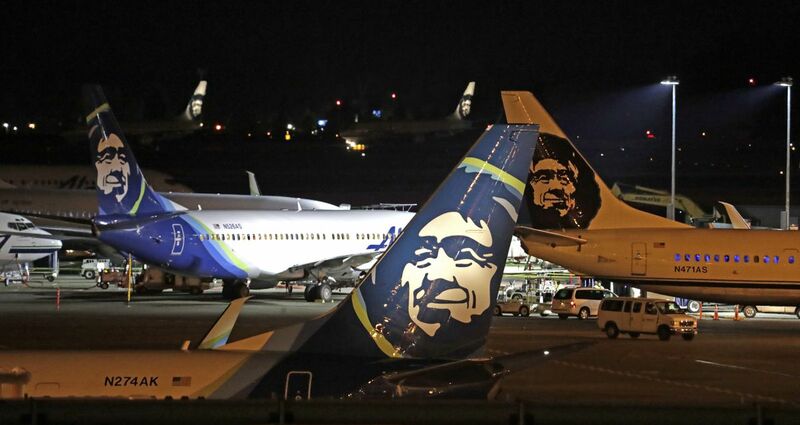 Though the employee was at the end of his shift — and had no purpose approaching the aircraft — he did have the right to be in the area where he made his heist, according to Brad Tilden, chief executive of Alaska Air Group, the parent company of Horizon. "We pride ourselves on being a leader in safety and we will be a leader on this issue," Tilden said at a news conference Saturday morning. "But we're less than 24 hours after the incident. It's far too early to say what additional procedures we might implement." One of the big unknowns is how Russell gained enough skills to get the Bombardier Q400 aircraft off the ground and fly it, since he apparently did not have a pilot's license, according to Alaska Airlines officials. According to Tilden, the aircraft took off at 7:32 from Sea-Tac, and the pilot flew for more than an hour before air traffic control — communicating through a ground control frequency — lost communications with him. During that time, as he flew south and then edged west over the water as two Portland-based F-15 fighter jets tailed him, he performed some impressive flying feats. "There were some maneuvers done that were incredible," said Gary Beck, chief executive officer of Horizon. It was not immediately known if Russell had ever taken flight lessons. At one point, when an air traffic controller tries to get a pilot to give Russell guidance on how to control the plane, Russell responds: "Nah, I don't need that much help. I've played some video games before." It is unclear what he meant by that comment. It could be some sort of action aerial video game, or possibly he was referring to his use of flight simulators, which can be accessed by the general public and give detailed flying information for specific aircraft. "The bottom line is that people approach it as a video game … It does give a very real feel, and the level of fidelity is really astonishing," said Jon Ostrower, the Seattle-area-based editor of Air Current, an aviation publication. Ostrower also said that many members of the aviation community freely share their knowledge about how aircraft work, and that could be another way the Horizon employee learned about flying. The stolen — and now crashed — aircraft had been parked for the evening Friday. Sea-Tac airlines, including Horizon, have been using parking spots about a half mile from the terminal. Locked down for the night, the plane should have had security tape around the doors so the next crew would know if anyone had entered without authorization. The employee used a push-back tractor to rotate the plane 180 degrees. That put it in position to taxi and make forward progress toward takeoff, according to Mike Ehl, from the Port of Seattle. That was one of Russell's jobs with Horizon, along with baggage handling and tidying the aircraft. He would also have had to remove chocks that hold wheels in place and remove parking brakes, according to a Horizon Air pilot who flies Q400s and spoke to The Seattle Times about getting the aircraft off the ground. But there are no locks on the doors, which helps ensure a quick evacuation in event of emergency. "You don't want doors that have the possibility to lock on an aircraft," said the Horizon Air pilot, who spoke on condition of anonymity because he was not authorized to speak to the media. "That's a system that if it were to malfunction in an emergency, everybody dies." Once the cockpit is entered, no keys are required to start the aircraft. Instead, a series of switches and levers must be pulled in a particular sequence to unlock the controls. "You could go on Microsoft Flight Simulator and pull up the flight deck for any type of aircraft and play with all the switches and buttons," the Horizon pilot said. "You could figure it out pretty easily if you were motivated." While a ramp agent wouldn't ordinarily know how to do that, it wouldn't be that hard to figure out, according to the Horizon Air pilot. Investigators are still trying to piece together what route he traversed during his takeoff from the congested airport. Asked how the man got the aircraft from the taxiway to a runway, Horizon Air CEO Beck declined to speculate. Normal procedures call for a flight crew to request clearance to push back the aircraft, and there would be communications with ground control all the way out to the runway. Then, the crew would be turned over to the tower for clearance takeoff. This was a much more chaotic process. Communications recorded from the Sea-Tac tower capture a controller repeatedly demanding identification from a Bombardier turboprop lining up on the runway. The unknown aircraft was on parallel runway 16c, according to Flight Global, website for the trade magazine Flight International. But it is unclear how he accessed the runway, and also how much of it he would have used, since an unloaded Q400 would need only a fraction of the full length to take off. "Aircraft on [taxiway] Charlie lining up runway 16C, say call sign," the controller states, according to the transcript reported by Flight Global. The controller sought to establish communication several more times, then learned from an Alaska Airline flight crew that the Horizon aircraft was taking off, according to Flight Global. Airplane tracking company Flightaware produced a detailed track of the plane's flight, including its altitude at each point, which shows that the maximum altitude reached was 8,000 feet. At one point the Horizon employee flying the plane complained of being lightheaded, and said he threw up a little. He asked a controller "how to make it pressurized." But the Horizon pilot said that unless you fly far above 10,000 feet, pressurization isn't an issue. "So he wasn't lightheaded because of a thin atmosphere. He was lightheaded for other reasons," the pilot said. At one point in the flight, video taken by people on the ground showed the plane upside down. Although this was described by others as a "loop-the-loop," that's not what happened. The man flying the plane did a barrel roll, or an aileron roll, which means he flipped it through 360 degrees around the fuselage axis. The Horizon pilot, who had watched that video, was categorical that it couldn't have been accidental. You have to move the flight controls in a particular sequence to do a barrel roll. "That was intentional," the pilot said. But he said that while the control inputs to make it happen are not difficult, pulling it off safely and well is very difficult. "A perfectly executed barrel roll requires a lot more skill than most pilots have," he said, adding that Russell "did not do it well." "It looked like someone doing a barrel roll for the first time," the pilot said. Russell appeared to take some pride, just before his death, in his flight skills. But he knew that getting it safely to the ground would be a tough task. "Hey," he asked the air traffic controller, "you think if I land this successfully, Alaska will give me a job as a pilot?"